Participants readily identified connections between environmental issues and the health of people in the communities. Community leaders, women and youth consistently ranked access to safe and reliable drinking water as a high priority issue in all countries and communities surveyed. Solid waste management, wandering stock, and mosquito borne diseases were also common to all communities. There were some minor differences observed between perceptions of women and other groups on health issues. Generally, women raised more issues relating to access to health services, and health issues specifically affecting children. Women were the only group who raised family planning as an issue for discussion. Water is a basic need for all people, and communities identified many uses of water including drinking, cooking, washing, laundry, obtaining food and as places of cultural significance (e.g. tabu places). The issue of accessing clean water was consistently rated as a priority issue by almost all communities involved in the RAP. Communities surveyed in Papua New Guinea and Solomon Islands reported difficulties in accessing water due to having to walk long distances (Liapo & Silanga), or water supplies becoming scarce in the dry season (Silanga & Aola). Mahe community in Malakula (Vanuatu) reported that access to water was a problem in new houses that were not connected to the distribution system. Despite having a distribution system, Veinuqa participants (Fiji), reported difficulties in accessing safe water in dry weather when the dam dried up. The dam was built with the intention of supplying the school, but is used by the whole village. When the dam is dry the village relies on ground water that has a high risk of contamination. Naimasimasi participants also perceived their water supply to be too small and predicted supply problems in the future due to population growth. Many Valupai participants perceived that creeks and springs around the region were flowing better in the past, and some participants provided a scientific explanation for changes based upon changed hydrology as a result of deforestation and the establishment of oil palm plantations. However, other Valupai participants explained a belief that the drop in water level is blamed on the catching and eating of eels which are believed to sustain the water source (a tabu [taboo] practice). Participants from Liapo Village and many participants from Silanga (PNG) reported that access to water was particularly difficult and many community members perceived that this is their most urgent problem. The women reported that men do not assist in carrying water, and the time taken to walk to the water source (a coastal spring 4 km from the village) deprives children of schooling and does not allow women time to do other activities. Solutions or opportunities to improve access to water were generally perceived to require assistance from the government or other organisation from outside of the community. 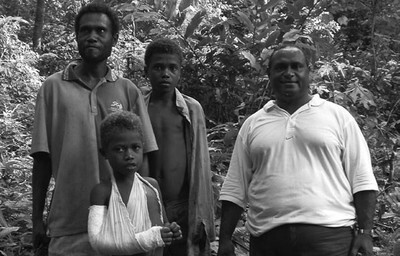 For example, Valupai youth perceived that the Water Board should install pumps or alternative supply systems, Silanga participants suggested that the Local Level Government should provide funds to build a ‘water supply,’ and Aola participants suggested that a logging company could provide assistance. Communities utilised a variety of water sources (Table 2). The villages in Vanuatu were the only communities with water distribution systems to transport water from the source to the majority of households. Fijian communities had limited distribution systems (often to communal taps) and reported ongoing problems with pipe maintenance and pressure.